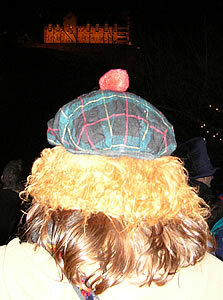 This page shows photos of Edinburgh's Hogmanay (New Year) celebrations. The New Year is celebrated more eagerly in Scotland than in other parts of Europe, so many people like to visit there at this time of year. 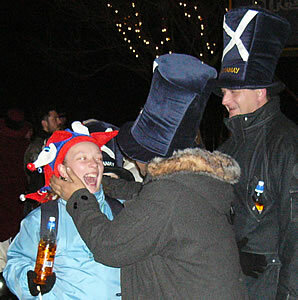 In Scotland there are two public holidays at the start of the year, compared to only one in England and Wales. 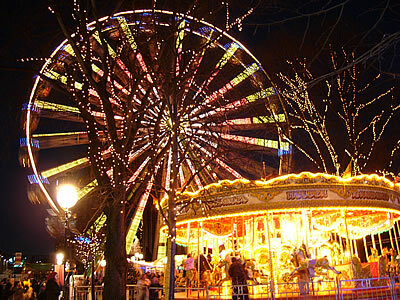 A funfair and ice rink are set up in Edinburgh for the Christmas and New Year period. It gets dark very early at this time of year (at about 3pm), but illuminations light up the city. 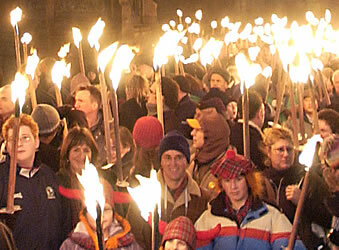 One of the events soon after Christmas (a couple of days before New Year's Eve) is a Torchlight Procession. People carry wax torches through the streets - these can be reserved by buying a ticket beforehand. 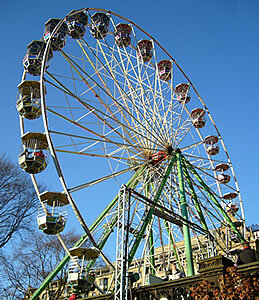 The usual route is from Parliament Square (on the Royal Mile), down The Mound, along Princes Street and up Calton Hill. Scottish pipers and drummers accompany the crowds. 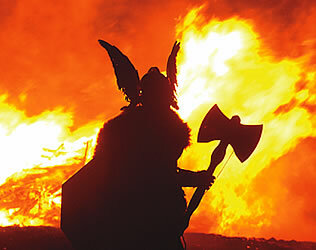 On top of the hill celebrations include the burning of a Viking longship and fireworks. On December 31st many people go to pubs and clubs and celebrate the New Year across the different time zones of the world. It is already New Year in New Zealand at 11am, and celebrations in Sydney (Australia) start at 1pm. 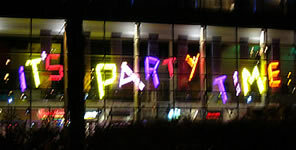 There is a street party in central Edinburgh (in Princes Street). 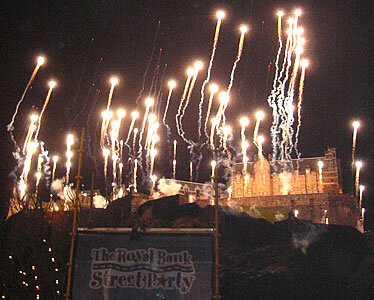 This is sponsored by the Royal Bank of Scotland and is known as The Royal Bank Street Party. You must buy a pass in advance if you want to join this (if you join an organised Hogmanay tour, these passes are normally included). 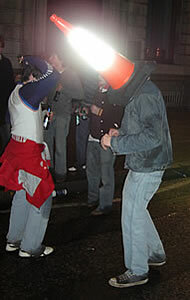 For safety reasons, no glasses or bottles can be taken into the street party area. 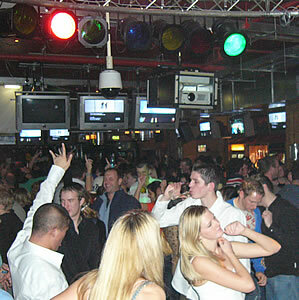 It gets very crowded, so if you are planning to get together with friends it may be easier to meet up before going there. Make sure that you go early - latecomers may find it difficult to enter Princes Street. A special ticket needs to be bought if you want to attend the Concert in the Gardens (on a stage in Princes Street Gardens). 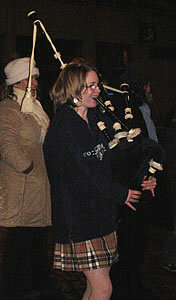 There is also a Ceilidh in the Gardens (traditional Scottish music and dancing). People who join the street party can usually watch the concert on a giant screen. 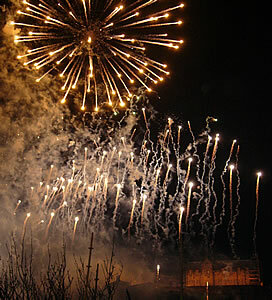 At midnight there is a firework display in front of Edinburgh Castle. The best views are from Princes Street, but if you can't go to the street party you can enjoy the view from any of the hills which surround the city. 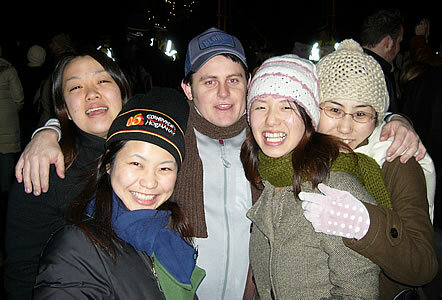 Make sure that you wrap up warm, as outdoor temperatures may be below freezing at night at this time of year. Kilt-wearers need to be particularly careful! If you are travelling to Edinburgh independently for New Year, make sure that you book accommodation as far in advance as possible. Prices are higher than normal at this time, and there is often a longer minimum stay requirement. Transport services also get full, so buy tickets early. Full details of Hogmanay events are normally released in October. Torch reservations, street passes and tickets for concerts or celebration parties should be bought in advance.